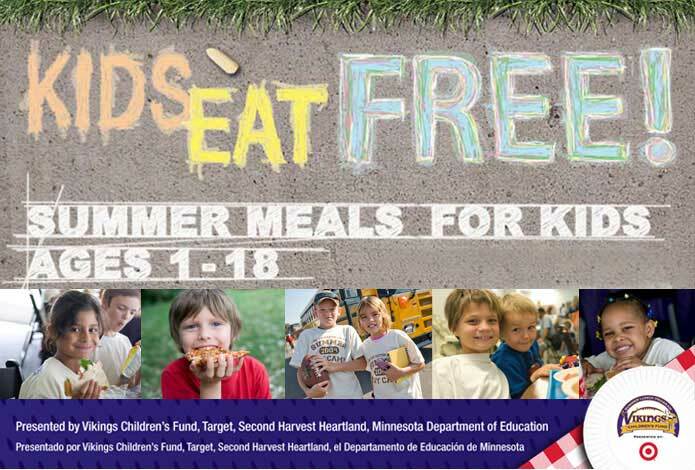 During the school year, approximately 290,000 Minnesota children receive free or reduced-price meals through the National School Lunch and School Breakfast programs. However, when the school year ends for the summer, only about 20% of these kids continue to receive these low-cost or free nutritious meals. That means that for nearly three months out of every year, more than 232,000 children in Minnesota aren't getting the nourishment they need. To fill the nutritional gap facing these children during the summer months, Second Harvest Heartland has teamed up with the Minnesota Vikings and Target to work with the Minnesota Department of Education to help facilitate the Summer Food Service Program (SFSP) in Minnesota and help bring more meals to more kids this summer. Do you know a family who could use a little extra help with food this summer? Check out the Summer Lunch Map, an easy-to-use tool for finding free food for kids across the state this summer. Families can also call 2-1-1 from a landline or text 612-516-FOOD for locations. Click here to make a gift. Together, we can ensure healthy, plentiful meals for Minnesota kids who need them to grow and thrive.